Alcohol-free, hyaluronic-acid infused, Antioxidant Perfecting Toner uses anti-aging, super-antioxidant, Ubiquinone, to nourish and perfect skin while boosting elastin and collagen production. Ubiquinone, also known as CoQ10, is a very accurate biomarker of cell age. As we get older, we make less and less of this important antioxidant. It is necessary for collagen and elastin production and plays a critical role in neutralizing free radicals. Antioxidant Perfecting Toner restores ubiquinone levels in your skin, helping to prevent signs of premature aging, smoothing away fine lines and wrinkles. And that’s not all. Aloe, chamomile, sage and cucumber extracts calm and reduce redness while hyaluronic acid helps to maintain your skin’s crucial lipid barrier. Papaya extract dissolves dull, dead skin perfecting your complexion for a fresh poreless finish. After use, skin feels smooth, prepped and ready for further anti-aging treatments. Compare to the ingredients in Prevage™ at many times the price. 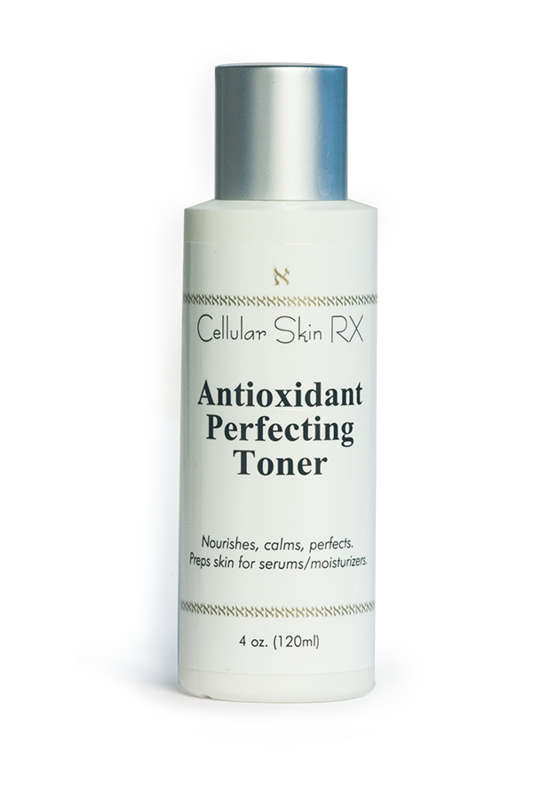 Up your antioxidant protection to a new level and see the difference this perfecting toner can make in your complexion. Matching Antioxidant Perfecting Cleanser available, too. Soak cotton ball or pad with toner. Gently sweep across all areas of face and neck. Let dry. Will not leave any film. Continue with serums and or complexes. Finish with moisturizer and sunscreen. Use twice each day to infuse cells with powerful anti-aging antioxidant, Ubiquinone. Matching Antioxidant Perfecting Cleanser is coming soon – the perfect match for this protective toner.